Summer in The Yukon is a time for doing, not blogging, it's just too damn short, and the last thing people need to read about is another weekend riding in Carcross, which is all I seem to have been doing this summer. And that's not a bad thing, in fact it's been great, but the Llama was feeling neglected, so it was time to take it for a walk. 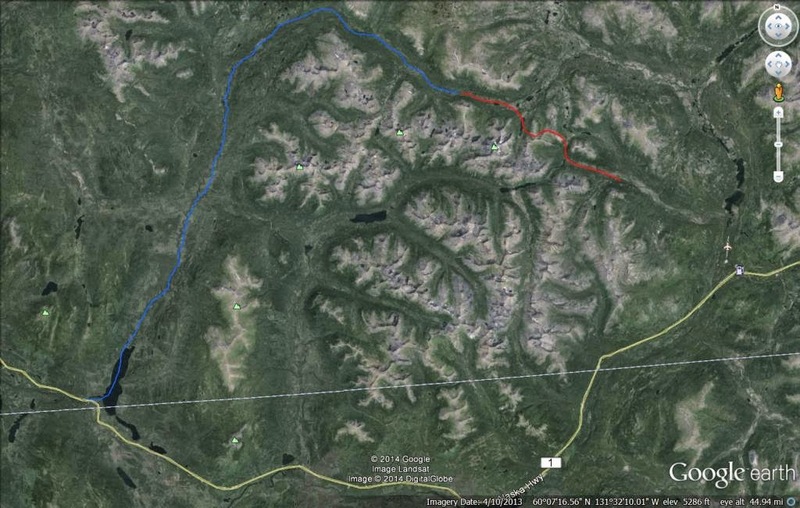 Grant R had just picked up a used Yak and was eager to test it out, so we formulated a rather unlikely looking route starting at the continental divide in the southern Yukon, and heading to the headwaters of the Morley river, then paddling it out to Morley lake and the Alaska highway. We left a vehicle at the Morley river bridge on the Ak highway, and then headed to Continental Divide, then 20 Km up an old mining road. After about 5 Km the road ended and we followed an old horse trail through the Alpine Fir forest and into the sub alpine meadows. It was very rugged, brushy country, and was not at all what I had been expecting. The cool thing about this trip is that it would allow us to access the upper Morley river, which I had never heard of anyone paddling before. So we had no idea what to expect. Perfect packraft country. The brush got terrible as we hit the first of the Beaver damned lakes, so we blew up and hit the water. The creek beyond was still much too small to even line, so we packed up and hit the bush, again..... It was really nasty going. We alternated between trying to stay near the creek and following bush covered eskers, but no one way was better than the other. It was getting high time to camp, and just when it looked like it would be a nasty camp in the Buck Brush, the river gods smiled on us and delivered us a perfect shingle bar amid the remains of an old Beaver pond. At this camp we had an amazing Wolf encounter. A big Grey fellow loped out of the brush right across from us while we were having dinner. He buggered off, but it was pretty neat. He was really, really big. The next morning, stayed in the creek and lined/paddled through more Beaver swamps. While the gradient stayed low, we could paddle, but as soon as rocks appeared and it grew steep, we had to hit the bush. The steep section eventually stopped, and we were able to get back into the boats, almost for good. A bit more water would have made things much better, but that is pack rafting. The creek grew rocky and the gradient steepened again, but we had enough water to paddle, at least most of the time. Ice lakes creek came in from the north, doubling the volume, and enhancing our paddling experience. After Ice Lakes creek, the river slowed down for a few kilometers. Early evening light on Slim mountain and the upper Morley river. The rock gardens started up again, and it was staring to get really old. There was just enough water to bounce and grind down through most of the steeper sections, but we were still out of the boats lining in the deep, boulder laden waters. It was getting late, dark and we were cold. We were hoping to camp where Slim creek joins Ram creek and forms the Morley, but it was a rocky mess with no camp sites. The extra water really spiced up the rapids, and the Morley was just rocking and rolling, so we just held on. I wished I had got some images, but there was just too much going on. One long cascade was probably hard III, but we wanted a campsite, so we just ran it. The river braided a bit, and I spied a clear spot on the banks. We jumped on it like Ravens on a gut pile. We were cold, soaked and hungry. A blaze soon rekindled our spirits. It was a poor site, with no room for the mid, but we strung a tarp and bedded down on the moss. The next day dawned frosty and sunny. Did I mention we had both elected to bring light weight sleeping gear? Bad idea. We woke up shivering every morning at 5 AM. Its August for crying out loud! The Morley slowed down and allowed us to enjoy the padding and scenery. We had been worried the water would force us to line more, as it had the day before. Moose were thick, as this river just has no access. We saw no old camps or any sign of people at all. Below the Moosey sections, the Morley sped up, widened, and became very, very shallow. We had enough to paddle, but barely. This is why you just can't get up or down this river. The river bed is rocky, and has been shaped by big spring floods draining this huge water shed, and late summer water levels just don't fill it up. Even in a canoe, you would be dragging for miles and miles. We were much luckier on the lower Morley with respect to camp site choices, they were everywhere. We found a great one on a Pine flat above the river. Perfect mid sites on Caribou moss. It was an especially frosty night with a lovely full moon. I had wrapped myself in the SilTarp as well as every stitch of clothing I had, but it was not enough and at 6 AM, it was fire and coffee. Early, but a fine way to greet the sun. The Morley continued to rock and roll us down stream. Nothing spicy, but just enough rock dodging to keep things interesting. Just before the river hits the final few swampy, windy Kms to the lake, it gets really wide and so shallow that even in the packrafts, it was nip and tuck to make it without getting out and lining. It was a stiff headwind, but the waves were not too bad when we hit the lake at 3 pm. Grant absolutely hates flatwater, so he hit the shore to walk, and I stayed out on the water to grind out the 6 Km to where the river leaves the lake. We arrived at the car, made the drive to get my truck, and got home at midnight.